Virginia Tech running back David Wilson gained 1,595 yards in the regular season, had 10 games in which he gained at least 100 yards and nine rushing touchdowns, so what happened last Wednesday night really was no surprise. 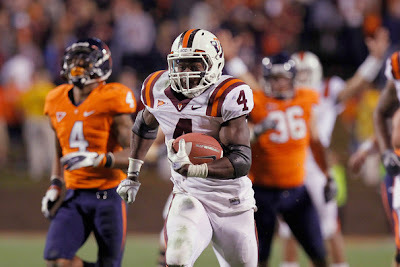 Wilson was recognized as the 2011 winner of the Dudley Award, given to the outstanding player in Virginia in Division I football. "To be associated with the great names who have won this award, and to play my college football in Virginia and win this award is a great honor," Wilson said. A statewide panel of sports writers, television and radio sportscasters and sports radio personalities vote for the award. The Dudley Award is named for the late Bill "Bullet Bill" Dudley, star player at the University of Virginia and in the NFL. Dudley, a member of the Pro Football Hall of Fame, played for the Pittsburgh Steelers, Washington Redskins and Detroit Lions. He was the NFL MVP in 1946.